A store like no other in Toronto, Evergreen Garden Market blends classic general store, contemporary gift shop and sustainable garden market into one place. 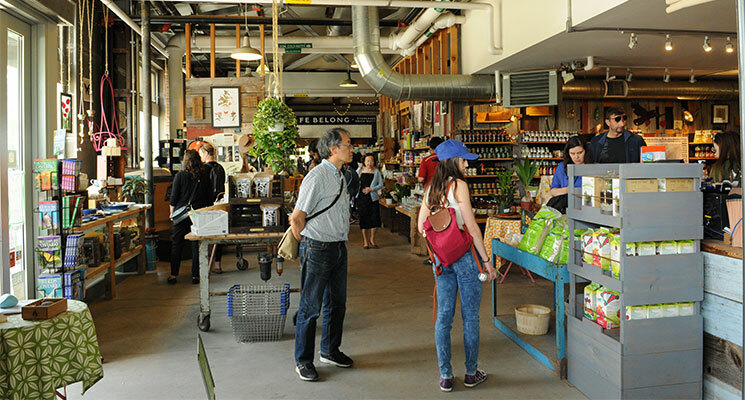 Welcome to Evergreen Garden Market, Toronto's home for a curated selection of local food, home décor, books, children’s games and toys, and a rotation of seasonal products. The garden centre is fully stocked with Toronto’s widest selection of Ontario native flowers, plants and trees for gardens of all sizes—container on your condo countertop to your backyard in the city. Evergreen Garden Market primarily carries products from artisans, craftspeople and small-batch producers in Canada. We champion Ontario native plants for their low maintenance and their positive impact on the local ecosystem. We don’t sell invasive plants. We support local growers and try to minimize that their products travel. These standards support the local and sustainable mission behind the Evergreen Garden Market—which is a social enterprise that directs 100% of its proceeds back to Evergreen, a national not-for-profit organization dedicated to making cities flourish. Not only will you love what you find at the Evergreen Garden Market, but by choosing to shop here you’re helping make your city flourish.